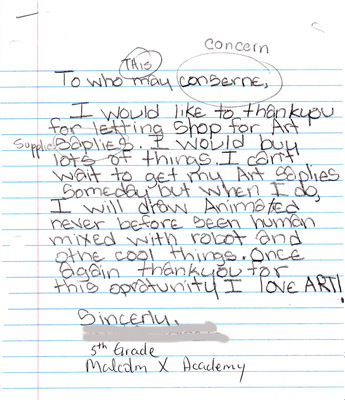 The childrens' art grant program that Rogers started and funds has it's first 5 recipients--- 5 children from the Malcolm X Academy in San Francisco will be going on a shopping spree at Blicks Art Store next week to pick out the art supplies that they desire. We’re soooooo happy about this!!! Here's one of the letters that was received... it's so cute, just needed to share it!! If you know of any children that would benefit from the program please apply here.